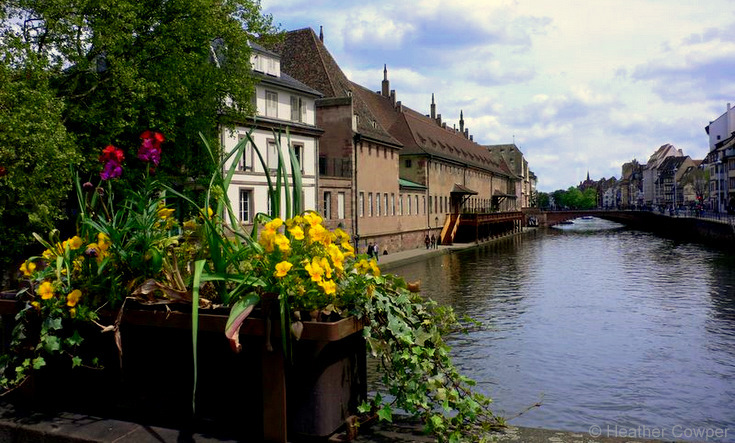 While we drove around Strasbourg, I learned so many fascinating things from our guide’s commentary. Passing through the diplomatic quarter we learned that the storks are the symbol of the city and we could see their nests perched like hats on top of the pollarded lime trees. In the 1970s they had almost disappeared from the region, but now there are over 400 in Alsace, and of course everyone knows that if you leave a piece of sugar out for the stork it will bring you a baby! I also discovered that Strasbourg has switched from France to Germany many times in its history, being on the border of the two countries. The statue of Mother Alsace mourning over her two dead sons killed in action, commemorates a time when families might have brothers from the same family fighting against each other in the French and German armies. No wonder that the people of Strasbourg believe so strongly in peace and host the Conseil de l’Europe to ensure that there is never another war in Europe. Our coach dropped us in the historic town centre, with half-timbered houses and we took a look around in the cathedral where the stained glass windows had all been cleaned to make their color extra bright. The morning in Strasbourg ended with a boat trip with guided commentary through the Petite-France area of rivers and canals where we had a view from the water of many more beautiful old houses. After lunch back on the Amadeus Princess, we boarded the coach once more for a wine tasting on the Alsace wine route, that runs through the rolling foothills of the Vosges mountains. We stopped at Domaine Hering (http://www.vins-hering.com/) where we passed through the cellars to see the steel vats and enormous oak barrels used to age the wine. Back upstairs, we learned about the six different kinds of Alsace grapes and tasted the Pinot Gris, Reisling and Gewurtztraminer. I also spotted that they make a Cremant d’Alsace, the local equivalent of Champagne but half the price. On the way back to the Amadeus Princess we also stopped at the pretty small town of Obernai, bounded by the river and old ramparts, designed to protect the wealth of the town that came from its wine. Tomorrow we will wake up in the small town of Speyer, with a visit to the university town of Heidelberg in the afternoon.